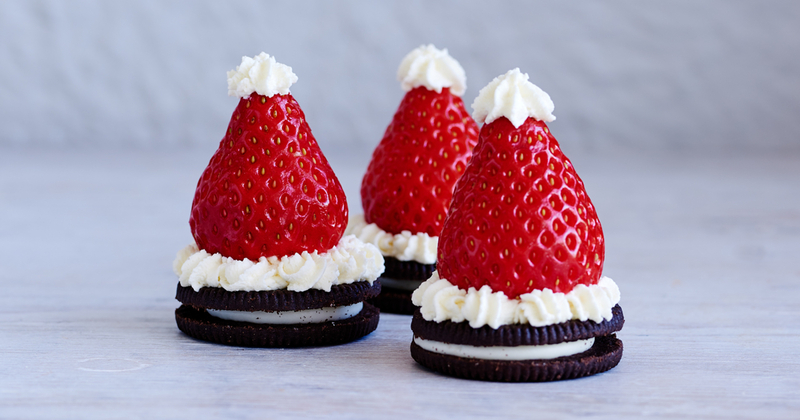 The fun is all in the decoration with these clever Santa hats #biscuits and they’re great for making with the little ones. 1. Whip the cream until stiff and transfer to a piping bag (or freezer bag with a hole snipped in the end). 2. Pipe a layer of whipped cream on top of each biscuit and top with an upturned strawberry, making sure the cream surrounds the strawberries like a cuff. 3. Pipe an extra dot on the top of each strawberry to make a pom-pom, arrange on a plate and serve. The fun is all in the decoration with these clever Santa hats biscuits and they’re great for making with the little ones.